Provide comfort for the family of Elfriede Bisson with a meaningful gesture of sympathy. 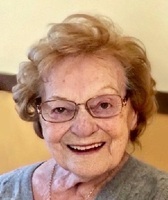 It is with great sorrow that we announce the passing of our beloved mother, Elfriede Bisson, 91, of New Britain, CT Sunday, April 14th, 2019. Elfriede was the daughter of the late Peter and Maria (Hasslocher) Wehner of Gross-Gerau, Germany. She worked as a Real Estate Administrator for Northeast Utilities until her retirement. Elfriede was predeceased by her husband Wilfred J Bisson, her grandson Keith Tabellione, and her sister Hildegard Splitt. She leaves behind her children to mourn her loss; her daughter Irma Campbell and her husband Bruce, her daughter Joanne Perez and her husband Joseph, her daughter Carol Lucey, and her son Wayne Bisson and his wife Kim. Elfriede will be dearly missed by her six grandchildren; Marissa, Daniel, Jessica, Kelly, Bradley and Ashley, and great-granddaughter Kara. She also leaves behind her cherished nephew Jorg and wife Dagmar of Nauheim, Germany. Elfriede was born in Gross-Gerau, Germany where she met the love of her life, her future husband Wilfred Bisson, an American G.I. They were married in Germany and came to the U.S. in 1952. In 1955, they bought a house in New Britain, CT where they settled to raise their family and fill their home with love for the rest of their lives. Her love was boundless. She was kind, considerate, accepting, and devoted to her family. Her smile greeted everyone as though they were close friends. She will be dearly missed. 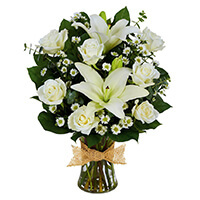 To send flowers in memory of Elfriede Bisson (Wehner), please visit our Heartfelt Sympathies Store. We encourage you to share your most beloved memories of Elfriede here, so that the family and other loved ones can always see it. You can upload cherished photographs, or share your favorite stories, and can even comment on those shared by others. Nieves, Enriqueta, Marina, Don, Alicia, and Marc sent flowers to the family of Elfriede Bisson (Wehner). You will always be in our hearts and cherished memories! Nieves, Enriqueta, Marina, Don, Alicia, and Marc purchased the Tribute Mixed Vase Arrangement - All White for the family of Elfriede Bisson.